The Ultimate Far Infrared Sauna Spa. A large luxurious massage table with built in MP3 player, two speakers, and an easy to use control panel with x3 Far Infrared Grande Dome Sauna and x1 Sun Ancon Chi Machine. Curtains are included. 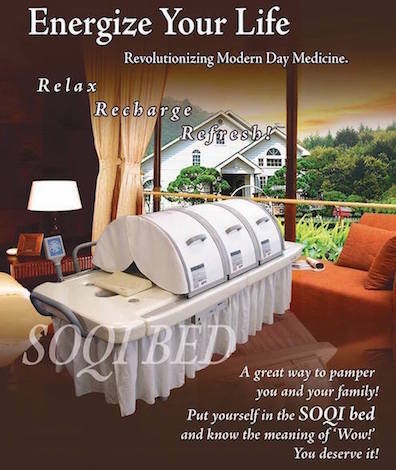 1) Clients that already own the original SOQI Bed who are wondering about the difference will note that the 'Grande' SOQI Bed is bigger than the original (discontinued in early 2018), so as to accommodate larger bodies (unless excessively overweight). The FIR Domes are also larger, and so the original FIR Domes were also discontinued for the same reason. Technical specifications are below. 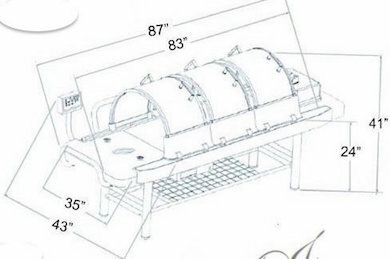 2) The Far Infrared heat penetration works just as well for a small person as a it does a larger person due to the nature of the design and the far infrared dome remaining close to the body. The SOQI Far Infrared Domes that come with the bed are locked down for safety and have a special connection plug to the remote control panel. However, the Domes may be purchased individually if desired, to accommodate use around the home, at work, or for travel. The individual domes come with a regular wall plug. Installment Plan Available - Interest Free (see below). Natural healing for home or business. No side effects, no toxicity, no risk of injury. 100% natural healing for health and wellness. 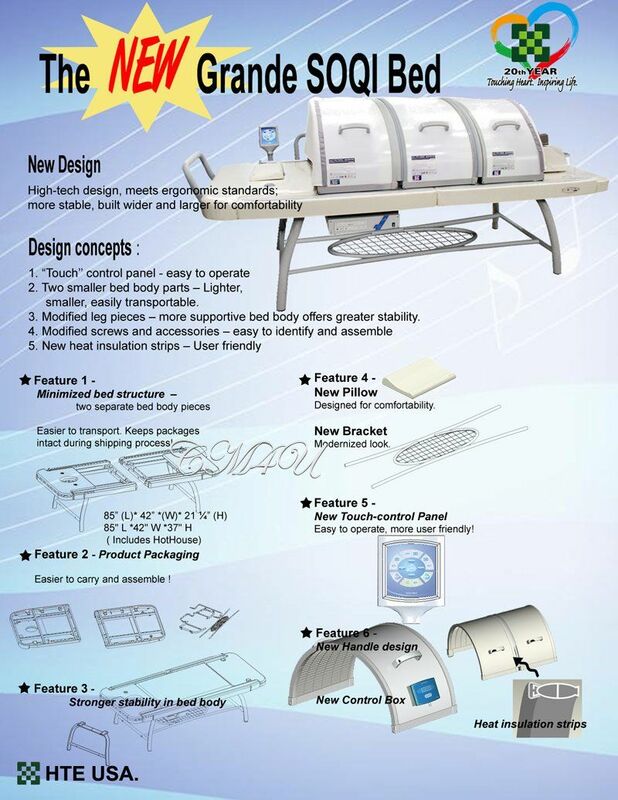 1) The Grande SOQI Bed is an excellent addition for any health care practitioner, clinic or spa. Complimentary to both conventional and alternative healing, it is recommended and used by many health care professionals worldwide. 2) Full body thermal therapy - relief from pain, swelling and inflammation, relaxation and much more. 3) Specific motion energy - aerobic respiration exercise - adds additional health benefits. 4) Clothing is optional as Far Infrared is a dry heat emitted from these ceramic body heaters with a silicone crystal chip surface, not duplicated or found in any other sauna unit on the market. 5) Close location to body for optimal penetration and maximum health benefits. 6) The Far Infrared sauna dome may also be used for your pets. Tax right-off for business owners. x5 monthly payments - Interest free. Detailed information and what it does exactly. Thermal energy and motion energy combined. Music, color, food, your body, your home. These machines may be bought individually. x1 Sun Ancon Chi Machine. Specially designed hinge and rail. Dimensions: L87" x W43" x H24"
CURRENTLY ONLY AVAILABLE IN USA. Plus shipping and sales tax. ©2002-2019 Machine International, Independent HTE Distributor.